Siberia has for centuries been a place known for being cold, rugged, and obsolete. There are many jokes told about Russia banishing people to Siberia for being political dissidents or criminals. Even though 38 million people live in Siberia today, one primary thought comes to mind: desolation. Temperatures can often plummet to -50F/-45C. Dozens of native tribes, however, still call this land home. Scientists have even discovered three distinct forms of ancient humanity living in the Siberian region. Though life in Siberia may be called difficult at best, it has also been called “home” by many for thousands of years. Siberia has resources of precious metals, minerals, and even oil. It also has one almost unending resource to provide: bone-chilling cold. Why would anyone want to visit Yakutsk in Siberia, a place called by many as the coldest city on the planet? Saying that the Permafrost Kingdom is Yakutsk’s biggest tourist attraction doesn’t mean a whole lot considering this city only has a few places to offer visitors. 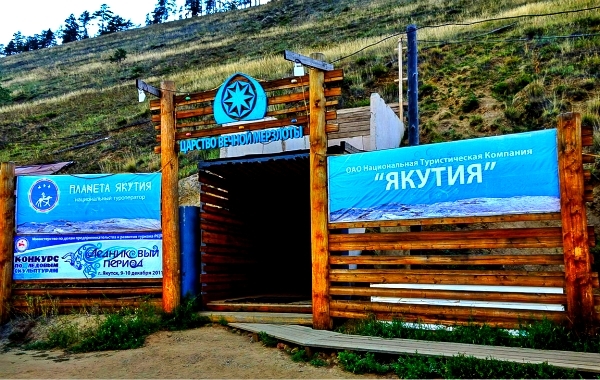 Still, the attraction itself is unique and complex, offering visitors a unique look at how humanity has adapted to the almost permanently cold conditions that Siberia has to offer. Originally built to be a refrigeration complex for food storage, it is now one of the world’s most unique bizarre tourist attractions. The Permafrost Kingdom is an elaborate complex of tunnels that are about 500 feet underground. In these tunnels are amazing displays of artistry that focus on Yakutsk’s one primary resource: ice. There are dozens of ice sculptures within the complex, but the fun doesn’t stop there. You can enjoy some local vodka in glasses made from ice. There’s a full office on display in the tunnels, complete with Wi-Fi and telephone access. You can take a snooze on their queen-sized ice bed. There’s even an ice slide that’s intended for the kids to use, but you’ll be tempted to slide down it yourself! Have You Seen Incredible Color In Ice Before? The idea of going to the largest city built on permafrost to see even more ice doesn’t seem very appealing – I’ll give you that. Think, however, about the dynamics of what this permafrost layer provides. Ice sculptures that don’t melt. Food that doesn’t need a freezer at home to stay edible. At the Permafrost Kingdom, the ice is jazzed up by some unique lighting to give the entire tunnel complex the feel of an amusement ride more than anything. Deep blues, greens, and other colors highlight the ice sculptures and artifacts on display, giving visitors a truly one-of-a-kind experience. Don’t forget to visit the world’s largest block of frozen milk before you step back out into the weather! Most people outside of Russia know Yakutsk for one reason: it appeared on the classic game of Risk. To get there, however, you’ll need to do more than conquer half the planet! Even though 200,000 people call this city home, getting there isn’t the easiest of tasks. Travel in the summer months is usually pretty easy by plane: just get to Russia and then take a flight to one of the two airports in Yakutsk. There is also one flight per week that comes into Yakutsk from Beijing. In the winter months, however, it is not uncommon for the city to be covered in freezing fog that makes landing an aircraft difficult. This fog can last for days at a time, which means a trip by air to Yakutsk in winter may not ever make it! That makes taking the train a viable option because as of last year, the Trans-Siberian Railway connects with Yakutsk via Irkutsk. Now you don’t have to ride in a taxi or a bus for 20 hours to get there! The M-56 “Lena” is the only road that is open all year to Yakutsk and because of the temperature extremes, the road is a difficult one to drive. Accommodations are available in the city year-round. Make sure you dress warm!